The New York Times calls Amir Vahab the "ambassador for a silenced music." Honored as a peacemaker and virtuoso, he is a composer, vocalist, and lecturer specializing in a wide variety of traditional Persian instruments: the tanbur, ney, daf , tar, and oud. Amir is noted for his expertise in Persian culture and history, and for the spirituality present in his music and teachings. Amir, the leader and principal player for the Amir Vahab Ensemble, has been described as "one of the world's most revered players and composers of Persian folk music." 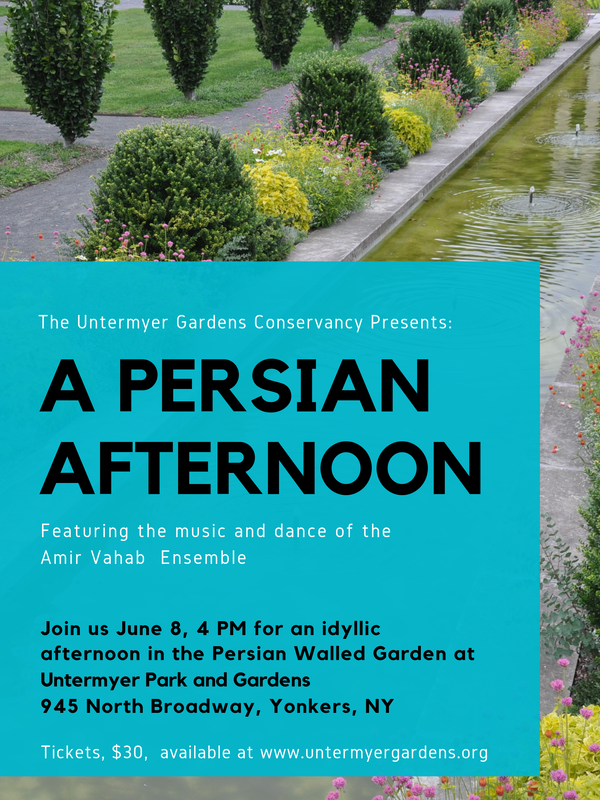 Join us Saturday, June 8, at 4 PM for an idyllic afternoon in the Persian Walled Garden at Untermyer Park and Gardens. Tickets are $30 and are available below. The Untermyer Gardens Conservancy is a 501(c)(3) organization and your contributions are tax deductible to the extent allowed by law.